But even those who used public transport were leaner than car users. The authors of the Lancet Diabetes and Endocrinology study say the findings show even a little physical activity is better than nothing at all. They reached their conclusions by comparing the bodyweights and lifestyles of the 72,999 men and 83,667 women in their study. Even when they factored in differences such as leisure-time, exercise, diet and occupation, the trend between commute method and bodyweight remained. And for both cycling and walking, greater travelling distances were associated with greater reductions in percentage body fat. By their calculations, an “average” height man would weigh around 5kg (11lbs) less if he were to cycle rather than drive to work each day. Likewise, the average height woman would weigh 4.4kg (9.7lbs) less. 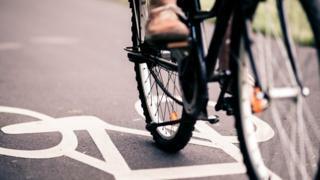 In the study, 64% of men and 61% of women commuted by car, while 4% of men and 2% of women reported cycling or doing a mix of cycling and walking. In England and Wales, 23.7 million people regularly commute to work and around two-thirds do so by car, according to census data. Study author Dr Ellen Flint, from the London School of Hygiene and Tropical Medicine, said: “We know that physical activity can help prevent obesity – absolutely we do – and yet, two thirds of the UK population don’t achieve weekly recommended levels of physical activity. She said it was important that policy makers and town planners make it easy for people to walk and cycle to work. “It’s a win, win really for public health and the environment,” she said. Next articleSee how dancers turned Trump’s appalling words into a powerful act of resistance.